Are you against eating out at Chain restaurants? I know a lot of people are. My only issue with them is that eating out can be expensive – and I honestly would rather pay for a meal at a place I’ve never been before and/or a local restaurant (especially in the suburbs where there aren’t many). However, Macaroni Grill has never been a chain that I’ve complained about because I have generally liked their food. But then the astonishing happened – they went and changed their menu. I swear it’s smaller….and it’s just not as good. Remember the create-your-own pasta option? Don’t bother looking for pesto sauce – it’s gone. Don’t bother asking for olives either, because they don’t serve those. No olives…..seriously? Macaroni Grill, what happened to you? 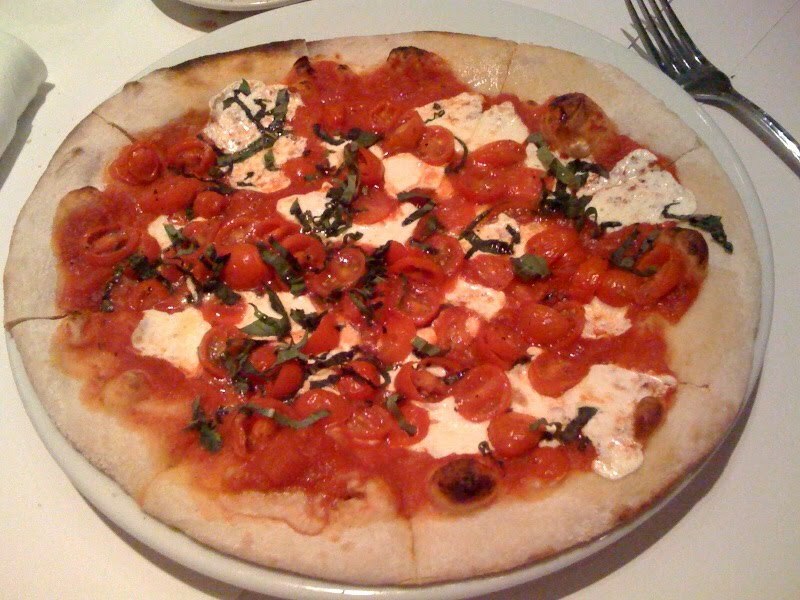 Dan ordered the Margherita Pizza ($7.99) and it was too soggy, mostly because it was just loaded with too many tomatoes. 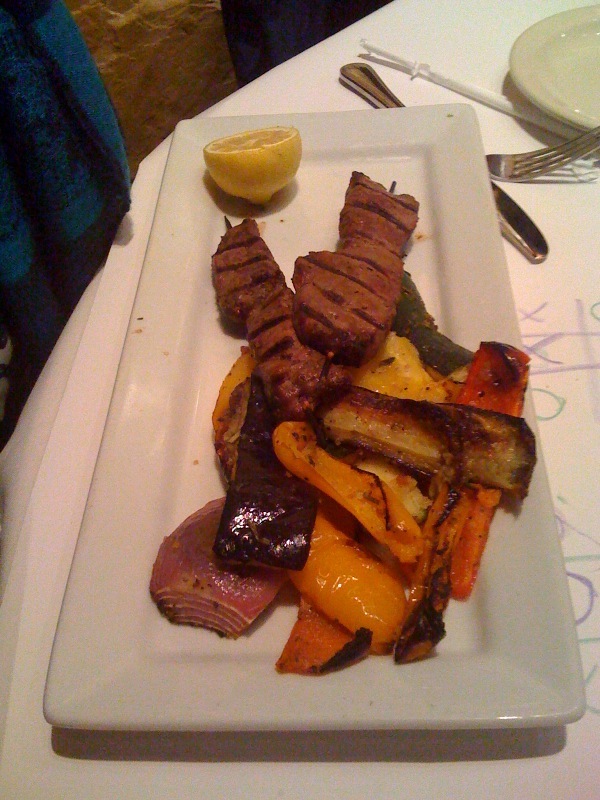 I ordered their Beef Tenderloin Spiedini – skewered beef with fresh rosemary served with roasted vegetables ($13.99), which actually wasn’t too bad though I was still grumpy because my favorite entrée was also gone from the menu – the orzo salad with spinach. WHYYYYY!?!?!?! Either way, I can’t imagine wanting to go back again – especially now that there are other Italian places around me that I enjoy so much, like Strapazza’s. Also – Basta Pasta has opened near me, so perhaps I should try that as well? Anyone gone there recently? I wouldn't have called them good, but they were edible before the menu change. Now they're pretty bad. I haven't been to the new Basta Pasta, but the one out in Fallston is pretty decent. I am not against eating out at chain restaurants - sometimes that is the only option depending on where you are located! never even heard of basta pasta! Beef Tenderloin Spiedini looks delicious! and it isn't very expensive. I think the price is perfect. Also you have to know that for food you don't have to think in cost, because food is food. Yes, what has happened to the MAcaroni Grill? Days prior to my birthday, our four kids were excited already about the special birthday dinner they would have for their mom at the Macaroni Grill. There was great anticipation about the birthday song they would hear, in Italian (they knew mom once lived in Italy, and could speak Italian). I assured my family not to make me a cake, I was looking forward to the free chocolate cake we would get after the wonderful dinner. Sadly none of this came to pass. My husband wisely let our waiter know it was my birthday. During our meal, our children could hear the lovely Happy Birthday song being sung at not one, but two other tables! They were excited about when their mom would get to be the one sung to. When the meal was over, we awaited our turn, but the cake never came. As the minutes passed by, the kids were getting restless, as kids always do. They were done eating, and the two year old had done his best, but the other kids were still hanging on. Our waitress was very busy, and managed to hurry to our table, and asked us if she could run our credit card, she also added she was sorry the Macaroni Grill had run out of chocolate cake. It was at about this very moment that the table directly behind ours was treated to the Italian birthday song. This was the third time we got to hear the song. But the kids were well aware that the song was for another person, not their mom. When the waitress was finally able, she brought us out a plate of four miniature cannoli and a to-go container. She suggested we take the cannoli home to eat. She also never asked us if we wanted the special song. But it was hard to explain to our kids why there was no cake, and no birthday song. Why did other people get cakes and songs? I’d like to tell other people with kids not to plan a birthday at the Macaroni Grill. It was a let-down to four excited kids. They felt so bad on the ride home. So did my husband, who wanted to make a nice evening for me. I then also felt obligated to tell them I was thrilled with the evening when I was really not. I went on about how nice it was not to have to cook, or wash dishes that night. We ended up re-doing the party at home...and of course there were a lot of dishes!